This post is part of a blog series on Pomomusings, discussing pastoral identity. To read about the series, as well as get a full schedule of participants, click here. I’m decompressing after a long day of work. The TV is on, my feet are up, and a Gilmore Girls DVD is in. In this particular episode, a one off character, Linny, explains to the main character of the show, Lorelai, why she became a psychologist – “I’ve always been a good listener, excellent note taker. I have fantastic penmanship, good head nodding abilities.” I nod along because it’s such a big part of who I am – a listener and head nodder (and someone who also happens to have fantastic penmanship). I’ve never minded the quiet. I’ve never dreaded silence or time alone. I’ve always been an introvert. And so, who I am as a pastor springs forth from who I am as a person – someone who listens more than she speaks. As a pastor, I listen in a variety of ways in an array of places. There are, of course, pastoral talks that happen in my office – holy conversations between a couple people in a couple of outdated chairs. Prayer and tears and questions arise. Listening occurs. There are sacred spaces in hospitals and nursing homes where fears are whispered and hopes are held on to. The soccer bleachers and middle school gym can be sacred space too, where life is shared between cheers for the game and the youth playing. In 2015, listening happens in some ways that weren’t even possibilities for my colleagues years ago. I have the opportunity to listen between the lines online; I read a post on Facebook and know the vagueness refers to an ongoing pastoral care need or perhaps a new crisis. My phone dings and I receive a text hours or minutes before worship with an update on someone in the hospital or a new prayer request that is to be shared with the community. These methods of listening do not have 9 to 5 hours, as if ministry ever was that nicely contained. In the listening I have the privilege to hear exciting joys, deep hurts, honest questions, tentative doubts. To be sure, there are other aspects to my ministry and my identity as a pastor, but listener is at the core. I listen for God in my own life too – some times better than others, but I continue to listen. I listen for God in the life of the church and the particular congregation I serve. The Session and I wonder together about who God is calling us to be as a community and what God is calling us to do in our mission and ministry. I listen, I listen, I listen … and then I speak. Words of comfort and care and shared tears. Shouts of joy and celebration and big hugs. I ask further questions. I share what I’ve heard. I nudge the church along to listen and share too. There is much we can learn from listening. 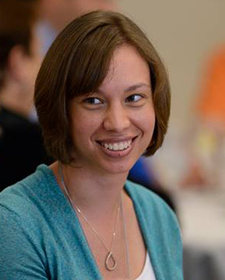 Emily Zeig Lindsey is the solo pastor of the First Presbyterian Church of Waterford, PA. When not listening to stories and for the Holy Spirit, she enjoys Zumba®, ballet, knitting, and reading. She and her husband Rodney enjoy visiting restaurants featured on Diners, Drive-Ins, and Dives and attending plays.